You Want My Social Security Number for an Application? Can Employers Request Sensitive or Confidential Information? Certain requests that employers make in job postings can be controversial, leaving job searchers in a quandary. They know that if they don't comply with the requests that they may never get invited to a job interview. The employer has every right to ignore their job application if the applicant didn't follow the instructions in the job posting. For an application’s validity, the job searcher must fulfill all requests listed by the employer. Job searchers are concerned about the privacy of their personal information on both paper and online job applications that are filled out and retained by the potential employer. In fact, to complicate the situation further, many online application processes won't save and enter a job searcher's application unless all relevant spaces are filled. Few provide a way for the online applicant to reach the Human Resources staff to discuss providing certain information when, and if, the applicant becomes a viable candidate for the job. Disagreement also exists about when and how much information is appropriate for potential employers to require when they have made no commitment to the job searcher. Increasingly, in this era of privacy invasion via hackers, new technology, and data theft, job searchers are wary about sharing personal information too widely. Employers need to know the laws of their state to collect appropriate data from employees and job searchers. Is Asking for the Applicant's Social Security Number Legal? It is not recommended that you provide this information on a job application. Keep in mind, though, that on many job applications, you are signing to provide permission to check references, do background checks, allow criminal record checks, and affirming that all of the information that you have provided on the application is the truth. With all of the new laws about guarding employee and applicant information security, it is not recommended that you ask for this information until the person is hired. Employers do not need or want to be responsible for guarding this information for the year that it would be accessible in a file. 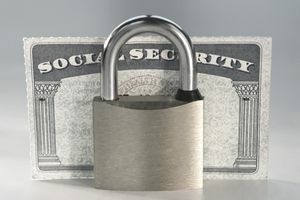 Increasingly applicants are objecting to handing over their social security number automatically. In this light and even if it might cost applicants the employment opportunity, increasingly job searching counselors recommend that applicants write "SSN available upon job offer" in that space. Employers claim that having this number up front allows them to streamline their hiring processes. But, employers need to understand that some of the best candidates are refusing to supply their SSN. Some will not fill out an application that does not give them the option of refusing on the assumption that they won’t receive consideration. When the employer invites the job searcher for an interview and especially if they plan to make a job offer to the candidate, job applicants need to understand that the employer will need the SSN to make background checks. Remember, too, that the applicant is signing the application to provide the employer permission to check references, do background checks, allow criminal record checks, and affirm that everything you have provided on the application is the truth. Not as controversial as required social security numbers, but still controversial, both salary history and salary requirements requests from employers also disturb job searchers. Job searchers regard the request for salary history as an infringement of their privacy. They also believe that by giving a potential employer that information, they have also given the employer the upper hand in any subsequent salary negotiation. This makes sense when you consider the opposing interests of the two in a salary negotiation. While not as strong of an invasion of privacy as a request for salary history, the provision of salary requirements is also viewed as giving the employer the upper hand in a salary negotiation. Most candidates are looking for the largest salary increase possible when changing jobs. In fact, making more money may be the reason they are changing jobs. Evidence also suggests that the practice of asking for salary history is one of the culprits in the gender wage gap since women are more likely to have spent time away from work for an extended period of time. Requiring proof of current salary is invasive and problematic for many job searchers. Asking for salary history and current salary is a redundant practice that turns off potential job candidates when you can obtain this information in a reference check with the candidate’s permission. Because of how job searchers feel and react, employers need to consider carefully when and how they request these kinds of information. You may lose exceptional candidates who are voting with their feet. You could cause candidates to experience a conundrum and all sorts of panic over how they can refuse your request without destroying their candidacy. Employers face a problem, too. If you've requested this information and most candidates supply it, how can you hire the candidate who did not? The goal of hiring an employee is a job match "happy dance," so why let your process turn off your prospects?